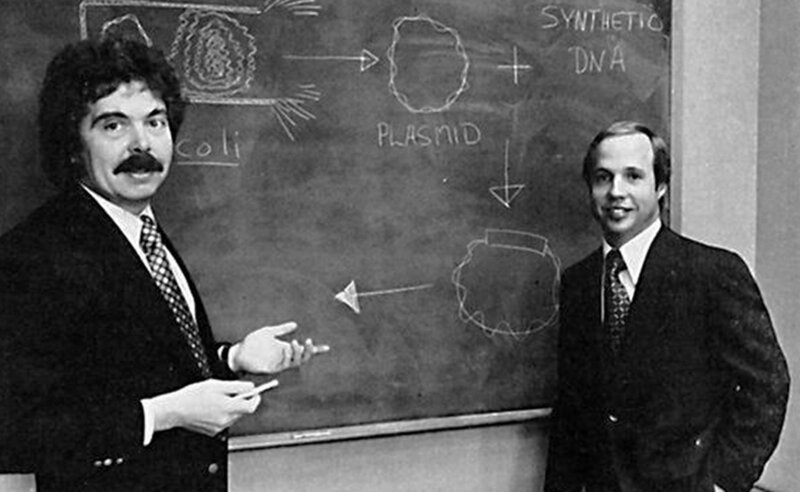 Genentech was co-founded in 1976 by Dr. Herb Boyer and Bob Swanson. Swanson, an MIT chemical engineering major, was a young partner at Kleiner Perkins exploring investment opportunities in bioscience. He had been monitoring the work of two biochemists, Stanford’s Stan Cohen and UCSF’s Boyer, who had made major breakthroughs in the development of recombinant DNA (gene splicing) technology and the ability to make human therapeutics in the laboratory. Swanson met Boyer and Cohen to pitch them on forming a company around their work. Boyer was enthusiastic, and over a beer, he and Swanson shook hands on a deal for us to provide seed capital for the new company. Swanson became Genentech’s CEO; Tom Perkins and Eugene Kleiner joined the company’s board. Brook Byers also assisted the Genentech team, working on product planning and market analysis. If the science underpinning Genentech was breakthrough, so too was their business model. Rather than building a business that would fund its own R&D and drug distribution operation, Genentech decided to partner with pharmaceutical companies that would underwrite those costs in return for marketing rights and a share of the profits. The first such arrangement was with Eli Lilly. At the time, Lilly was the country’s largest manufacturer of porcine insulin to treat diabetes. It had relationships with the medical community and a distribution operation in place, but wanted to expand its market share with a better product based on novel R&D. Genentech had the right product—human insulin developed from recombinant DNA technology—but didn’t want to invest in building an expensive sales and marketing effort. The Lilly/Genentech arrangement became a model repeated many times over with multiple drug companies. When Hoffman-La Roche acquired full control of Genentech in 2009, the company had a valuation of $100 billion. Tom Perkins was an out-of-the-box thinker who helped Genentech pioneer a new way to attract scientific talent. Before Genentech, life sciences researchers operated mostly in academia. That’s where fundamental research was conducted, and having the freedom to publish the results of the research gave the work essential credibility. Genentech broke the mold, hiring scientists and promising them the freedom to publish their work. With that approach, Genentech hired many academic superstars, becoming a biotech powerhouse. Genentech’s 1980 IPO changed how people thought about public offerings. Led by underwriter Hambrecht & Quist, the transaction raised $35 million, with shares jumping from $35 to $88 after less than an hour of trading, dramatically boosting public interest in IPOs generally and in biotech companies particularly.